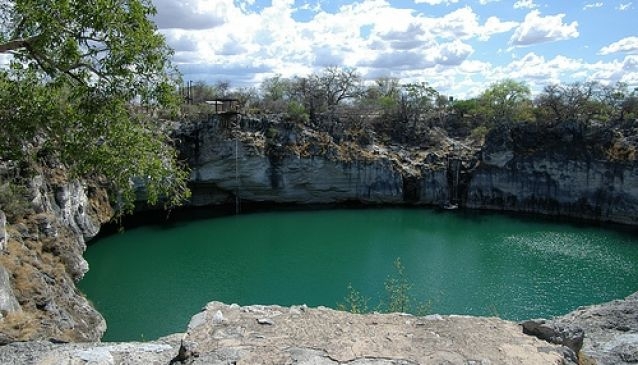 Lake Otjikoto is located near the mining town of Tsumeb. It is part of an underground river system. The lake was explosed when the roof of what used to be a dolomite cave ‘caved in’. The lake is relatively small, with a diameter of just about 102m, but it is really deep, reaching an estimated depth of approximately 142m in some places. The lake is en-route to the Namutoni entrance of the famous Etosha National Park. During the World War I, the Union of South Africa which was still part of the British empire was ordered to invade German South West Africa (Namibia). The German troops were totally outnumbered but somehow managed to hang in there for almost a year before being forced to surrender. The final showdown took place in the vicinity of Otjikoto and instead of surrendering their weapons and artillery including the heavy guns and ammunition wagons, they dumped them into the lake. Many of these artifacts have been recovered but not all of them. The lake still contains a variety of artillery pieces and rumors are rife that the German troops also disposed of their war chest in the same manner. There are tales of a large safe with its edges and keyhole sealed with molten lead and containing six million goldmarks being lowered into the lake, the safe was never seen again. The first Europeans to see Lake Otjikoto were the Englishman Sir Francis Galton and the Swede Charles Andersson who accidentally discovered the lake in 1850. 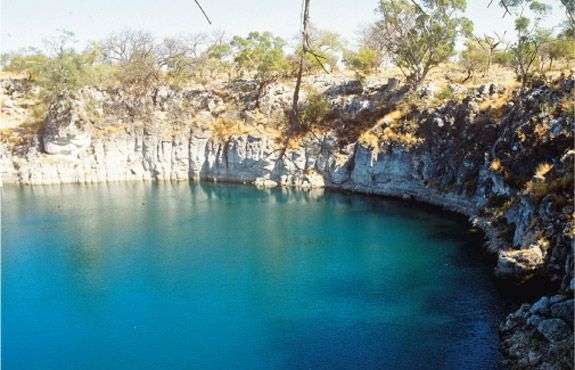 The name of the lake was taken from the Herero language and can be translated to mean ‘deep hole’. The San people refer to it as “Gaisis”, which means ‘very ugly’ because they were frightened by the deep water. When Galton and Andersson found the lake they went for a swim in it which stunned the Herero and Owambo people as they believed that no one could survive the mysterious waters. The lake is also home to a rare and endangered species, the Otjikoto Tilapia. Lake Guinas is located southwest of Lake Otjikoto and is deeper and has a tad more to offer in terms of aesthetic value. Accommodation in the area includes Dornhugel Guest Farm; Fiume Lodge & Game Farm; Gabus Game Ranch and Guest Farm Ghaub. 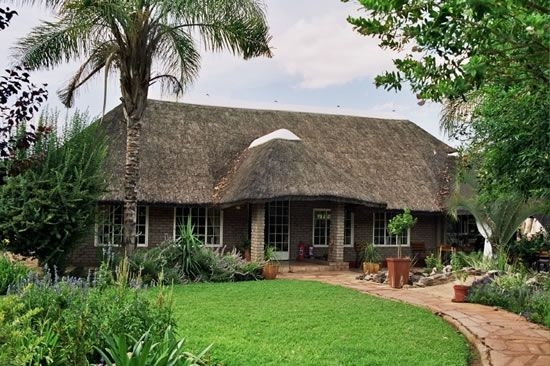 Dornhugel Guest Farm is located about 42km from Grootfontein and is the perfect place from which to explore the Bushmanland; Caprivi Strip and Etosha National Park. It was once a cattle farm and has belonged to the Beyer family since 1908. Guests can enjoy the amazing sunsets from the lapa or dive into the depths of a moonlit pool. 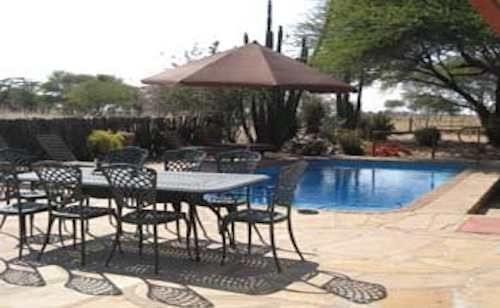 Facilities include a library/video theatre; tennis court; open-air chess; target shooting (air gun or cross bow); croquet; telescope and lectures on Namibian farming are also available. Meals are served in the comfortable restaurant or outdoors on the patio. Accommodation includes two single rooms which are equipped with en-suite bathrooms; ceiling fan and mosquito net or three double rooms which have twin beds and similar features as the single rooms. Fiume Lodge & Game Farm is owner managed and set on a private game farm spanning about 1400 hectares about 35km north of Grootfontein. It is the ideal stopover from which to explore the Zambezi Region; Etosha National Park and the Khaudum National Park. The Bushmen people and their way of life is the main feature of the activities offered. There is a sandstone walkway that leads to the main building which houses the restaurant; dining room and bar. Divine food is served and the barbecue and outdoor dining area are popular features. The lodge also has WiFi access as well as locally made curios which can be purchased from the bar. 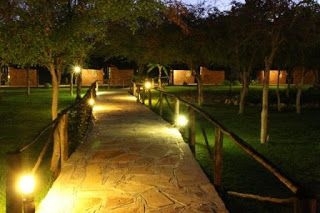 Guests can cool off at the pool or enjoy a sundowner while viewing game that stop for a drink at the floodlit waterhole. Accommodation at the lodge is in nine stone and thatched chalets which are equipped with twin beds; en-suite bathrooms; air-conditioning; built-in cupboards and a tea/coffee station. Gabus Game Ranch is located about 10km from Otavi and it is set at the foot of the Uiseb Mountains on private land spanning about 7000 hectares. Gabus Game Farm offers a variety of game; hiking and amazing photographic opportunities. Meals can be served in the main thatched building and a healthy breakfast is served in the restaurant or under the lapa. Dinner consists of game meat; farm fresh vegetables and salads. Lunch can be ordered and vegetarian meals can be prepared upon request. The swimming pool provides relief on those hot days. Accommodation is in six rooms which have en-suite bathrooms; air-conditioning; twin beds mosquito nets and a private verandah overlooking the floodlit waterhole. Guest Farm Ghaub is located in the Otavi Mountains and was once a mission station. It was converted into a guest farm in 1999 and still has an old-style atmosphere. The central areas of the lodge are homely, there is a cozy lounge/bar area furnished with comfortable sofas and a slightly larger dining area which is fitted with pine chairs and square tables. There are ten large rooms with high ceilings; large French doors; wooden and cane furniture and a private porch with views of the surrounding area. Each room has an en-suite bathroom; ceiling fan; tea/coffee station; dressing table with mirror and chair; wardrobe and electric shaver point. Most meals are homemade and breakfast includes options of homemade bread; cold meat; cheese; juice; tea/coffee; fruit and yogurt as well as bacon and eggs. Lunch and dinner can be ordered from the chef’s a la carte menu.